The International Plasma Protein Congress (IPPC) took place in the city of Prague, Czech Republic, on March 14-15 and aimed at pointing solutions to improve access to care. The meeting welcomed 300 representatives among patient groups, policy makers, regulators, physicians, scientists and industry leaders and pressed the importance of cooperation between all plasma stakeholders. The first day of the IPPC 2017 featured sessions discussing primary immunodeficiency (PID) care, Anti-D and haemolytic disease eradication as well as national access to plasma protein therapies. The second day focused on supplier experience, international developments in the plasma industry, regulatory aspects, Health Technology Assessment (HTA) and fair access to therapies. 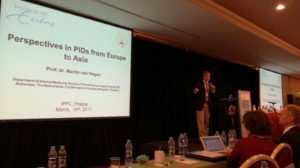 Prof Martin Van Hagen (Erasmus University, Rotterdam) a member of the IPOPI Medical Advisory Panel, provided an excellent overview on the latest developments in PIDs in Europe and Asia in the congress session dedicated to PID. 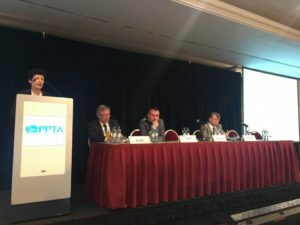 Martine Pergent, IPOPI Vice-President and representative of the French PID national PID patient association (IRIS) provided an interesting presentation on the plasma and blood policies and challenges in France during the session on ‘How to ensure better national access to plasma protein therapies’. The 2017 Hilfenhaus Award was presented to Prof Henrietta Farkas, MD, PhD, DSc, of the Hungarian Angioedema Center at Semmelweis University in Budapest, Hungary. Over her career, Prof Farkas has been dedicated to treating those suffering from Hereditary Angioedema and working to improve treatments and patients’ quality of life. The host country, Czech Republic, has a long tradition of blood transfusion and plasmapheresis. The congress programme allowed local representatives such as Mr Jaroslav Zverina, the former Czech Member of the European Parliament and Dr Milos Bohonek from Military University Hospital Prague to give an overview of the health and plasma policies and trends in the country. COPYRIGHT © 2019 IPOPI. ALL RIGHT RESERVED.